Budget Three Tier Wedding Cakes- Welcome to our online wedding cake shop! 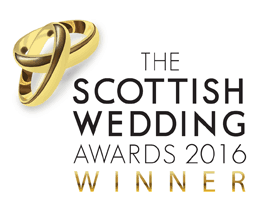 With over 32 years professional experience, Jenny’s Cakes is among Scotland’s most trusted and experienced wedding cake bakeries. We are delighted to present brides and grooms two Online Wedding Cake Shops! *NEW* You can now Book your Wedding Cake with a Deposit of just £60! Getting married in Gretna? We provide high quality professionally made wedding cakes, suitable for smaller Gretna Weddings. Made by Hand, with flavour and colour choices- personally delivered to your venue in and around Gretna/Gretna Green. Choose and order your Gretna Wedding Cake directly on our website. Book your wedding cake with a deposit of just £60! Choose Your Gretna Wedding Cake -Shop Today! Why buy a Wedding Cake from Jenny’s Cakes? Ready to Order Three Tier Wedding Cakes from under £300. Book your cake with a deposit of just £60 today! Choose Wedding Cake Colours, Flavours, Ribbons and Style, then order below- easy! You can Up-size your cake (at additional cost). This is a Thee-Tier wedding cake in our Simply Chic range of budget wedding cakes. This cake is the ‘Simply Chic Dotty Roses’ cake. The main design features of this cake are the hand-piped dot pattern on the middle tier, and the band of roses and buds around the middle tier. 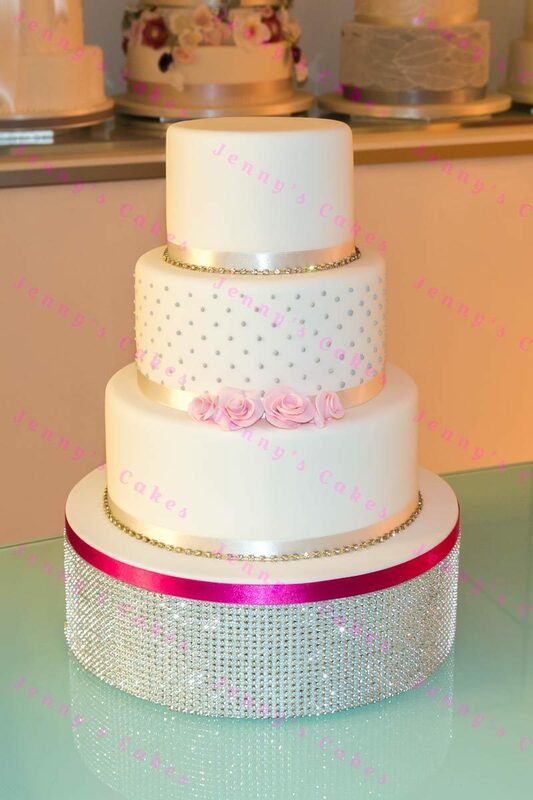 We have also added diamante strips around the top and bottom tiers, to give your cake a bit of extra sparkle! This round stacked wedding cake features a choice of ribbons, to tone with your bouquet or colour scheme. There are cake filling options including flavours such as chocolate, lemon drizzle, vanilla and victoria sponge for top, middle and bottom tiers. Finally, you can select the date for collection, or options for delivery to your venue by our staff. Jenny’s Cakes are experienced Multi Award-winning wedding cake bakers ! This is probably the most important cake you will ever choose, so it makes sense to have a wedding cake bakery you can trust. If you are looking for a beautiful and delicious wedding cake at a great price, we can help you! Our budget wedding cakes (our Simply Chic range) are made with the same high quality ingredients as our larger ‘Designer’ wedding cakes. (e.g. 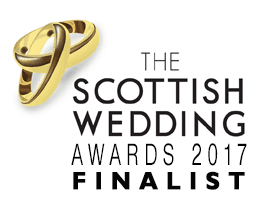 Glasgow area, Edinburgh area, Ayrshire, Gretna Green, Loch Lomond etc.) for an additional cost. These budget wedding cakes are based on our most popular wedding cake designs, with simplified decorative elements, still providing you with lots of choices. Designed for around 70 guests, but you can increase sizes to around 90-100 portions- simply select the Larger Size option within the cake detail pages below. Just choose your preferred design from the wedding cakes above, and select your options for flavours, ribbons etc. We will confirm your order within two of days of receipt. We hope you like our Affordable 3 Tier Wedding Cake range. With Best Wishes, Tom and Jenny Breen, Directors, for Jenny’s Cakes Ltd.